Alex Debogorski 2010 King of the Road Book Tour: "King of the Road" books now for sale in our Official Store! "King of the Road" books now for sale in our Official Store! YOU HAVE BEEN WANTING THEM...NOW WE'VE GOT THEM! 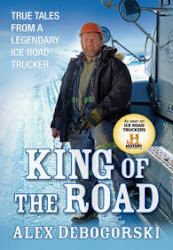 Alex's book, "King of the Road - True Tales From A Legendary Ice Road Trucker" is now available in our Official Ice Road Trucker Store! Before Alex headed out on tour he took some time to sign a limited supply of his books...so you guessed it....if you order your book here....it will be SIGNED BY ALEX HIMSELF!